Kevin Ellison #4 of the USC Trojans looks on against the Ohio State Buckeyes on September 13, 2008 at the Los Angeles Memorial Coliseum in Los Angeles, California. Former USC safety and team captain Kevin Ellison died last week while walking along a freeway in Southern California, it was reported Monday. He was 31. 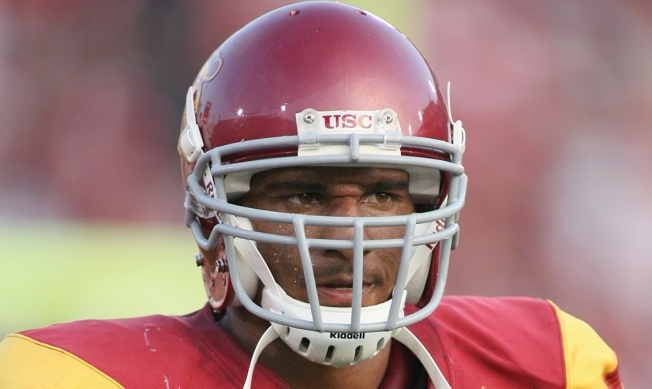 The school confirmed Ellison' death in a social media post Saturday with a photo of him during his USC playing days and the hashtag "FightOnForever." Chris Ellison told the Los Angeles Times that his brother was walking along the 5 Freeway in the San Fernando Valley at the time of his death. "He was disoriented and didn't know where he was at," Chris Ellison said. "I'm sure he was trying to come home and find his family. We love him so much." The California Highway Patrol received reports of someone running across the freeway late Thursday night. Records from the Los Angeles County coroner's office show Kevin Ellison died on a freeway. No cause of death was listed. An exam is pending. The Times also reported that Ellison's family plans to donate his brain to Boston University researchers who are studying chronic traumatic encephalopathy. CTE is linked to repeated brain damage, including concussions suffered by football players. "Kevin was liked and loved by everybody," Chris Ellison said. "His smile and personality would light up a room." Ellison faced federal arson charges in 2012 while playing for the Arena Football League's Spokane Shock after he caused $50,000 in damage by setting his bed on fire at the Big Trout Lodge in Liberty Lake, Washington. According to court records cited by The Times, Ellison said God told him to set the fire. "My mom and sister and dad and brother did everything they could," Chris Ellison told The Times.